Since its 2002 introduction, the CRF450R has earned an enviable racing pedigree, and the 2017 edition is the best yet, with superior technology and style. Riders know that the most important part of any motocross race is the start, and the new CRF450R Unicam® engine has been developed to achieve overwhelming performance in the first 100 feet of battle, offering increased power output but also allowing unparalleled traction. And while arriving to turn one first is significant, winning requires staying in front for the entire moto, which is why Honda engineers designed an all-new chassis with reduced weight and centralized mass. The result is a machine that is at once fast, reliable and forgiving, and that allows riders to more easily extract maximum performance, consistently turning low lap times while simultaneously taxing their bodies less. Honda also took the opportunity to announce the remainder of its 2017 model-year CRF competition dirt bike model line, including the CRF250R and CRF150R motocross bikes and CRF450X and CRF250X off-road motorcycles. Everything about the new-from-the-ground-up 2017 CRF450R is designed for the absolute holeshot. A new Unicam engine offers increased power and torque across the rev range, thanks in part to an ultra-direct downdraft air intake, steeper valve angle and twin exhaust system with smoother routing. The chassis boasts new geometry and packaging that results in a more concentrated, lower center of mass, helping to get the power to the ground, maximize stability and improve cornering performance. The lighter aluminum frame has a narrower cross-section and a lighter, extruded aluminum rear subframe. The motorcycle is equipped with a coil-spring 49mm Showa fork, while the rear suspension comprises a lighter swingarm assembly and a shock with a lower mounting position. Dunlop Geomax MX3S tires come standard, and the CRF450R is the first mass-produced motocross bike ever to come with a titanium fuel tank. Electric start is available as an option. 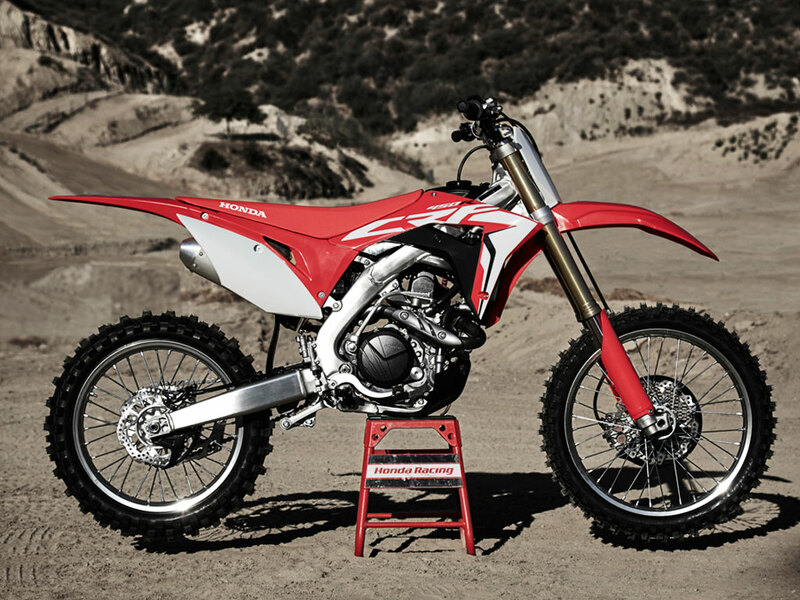 As a brand-new model, Honda’s CRF450RX boasts most of the features of its motocross-directed sibling, but in a package that’s designed for closed-course off-road riding and racing. Among the features that distinguish it from the CRF450R are a smoother ignition map and standard electric start (with kick-start backup), while chassis differences include off-road-focused suspension settings, a revised cylinder-head hanger and changed wheel hubs and axles. The CRF450RX also comes with off-road-appropriate components like a larger plastic fuel tank, forged-aluminum side stand, 18 inch rear rim and Dunlop Geomax AT81 tires, making it the ultimate weapon for events like those in the GNCC series.